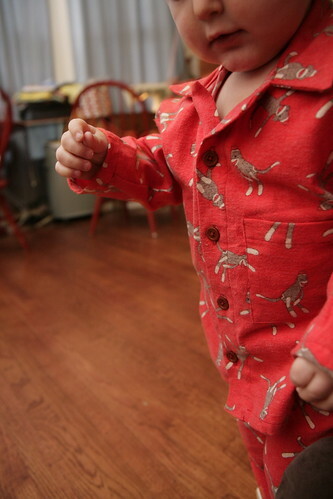 Inder Loves Folk Art: Sock monkey PJs. You can tell I'm trying to avoid a heap of unfinished projects right now, because I can't stop starting new projects! Like, instead of working on one of the two quilts I've started, or working on the dress I planned, or sewing up the tote bag I started six months ago, or even mending Joe's skinny pants, which had a mishap in the dryer (the stitching on the elastic busted open), I made Joe a set of sock monkey pajamas. 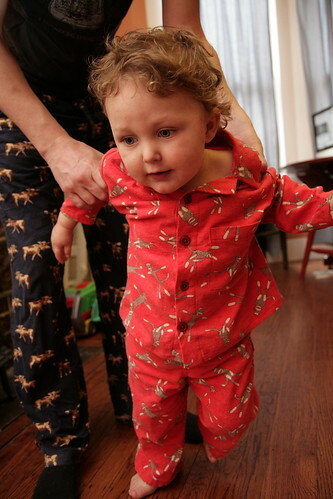 Because, you know, I just got this sudden notion that my kid needs old man pajamas. In red sock monkey flannel. Of course. No time to stop and pose! It has been a long time since I posted about sock monkeys, but needless to say, my love of these Depression-era "make-do-with-what-you-have-even-if-all-you-have-is-socks" softies has not abated. Sock monkeys have recently had a surge of popularity, and there is a whole line of sock monkey fabric, and it is, um, possible that I have a little bit of every print in the line? Ahem. For the pants, I used my trusty self-drafted pattern, which recently got a little expert help from my friend Andrea, who actually went to school for this kind of thing. So now they have plenty of room in the bum but aren't the least bit baggy. Sometimes, this whole pattern drafting thing seems almost magic. Look at the cute pants, not the grody stairs, please. For the top, I used a simple camp shirt pattern from Heather Ross' Weekend Sewing (which also provided the original starting point for the self-drafted pants), "Kai's shirt." 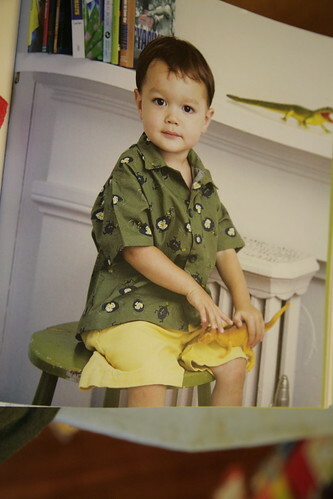 Here's the photo from the book. My experience with this book has been mixed - the ideas are great, but there are lots of errors - so I am thrilled to report that this is a great basic shirt pattern! I made it in size 2, which is plenty roomy on Joe. The only thing I changed was that I lengthened the sleeves to make it a pajama top (oh, and I interfaced the collar, which I would recommend). Other than the lack of interfacing (likely an attempt to make the pattern "easier" to sew, but that's silly, collars should be interfaced), I didn't notice a single issue with the pattern or instructions. Completely unprompted by me, Joe found one of his his sock monkey books and posed for this shot. Because Joe is speech-delayed and not as articulate as other kids his age, he sometimes surprises me with his clear grasp of concepts. 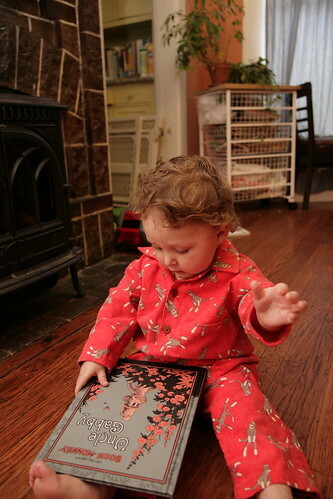 Like, sock monkey pajamas ... sock monkey book! I'm obviously raising this kid right! Here's where I had Steve grab Joe for a better shot of the front. Joe is not the most cooperative model - he is always on the go. I thought it was funny that Steve was wearing his moose-printed flannel pants. Edited to add: Joe wore his new PJs all day yesterday, until he got them muddy and we tossed them in the laundry. When I pulled them out of the dryer this morning, he insisted on putting them on again, and is currently wearing them over his green and yellow striped footie pajamas, which frankly, hurts my eyes. But that's okay, because this is the first item of clothing that I have made for Joe that he has expressed a strong preference for and demanded to wear, and that warm fuzzy feeling more than makes up for the visual assault. They're wonderful! I love the image of him layering them over his other pajamas. Definitely warm fuzzies. Definitely. isn't that the best feeling when they don't what to part with something you've made for them? and i'm loving your humorous tone--such a delight to read!